This week, we had the pleasure of interviewing one of our favorite food trucks, Grill 'Em All! If you haven't heart of them, where have you been?! They competed on the first season of Food Network's The Great Food Truck Race and were crowned the Season 1 winner! Grill 'Em All burgers are unlike any burger you have ever had or any burger you will ever have. 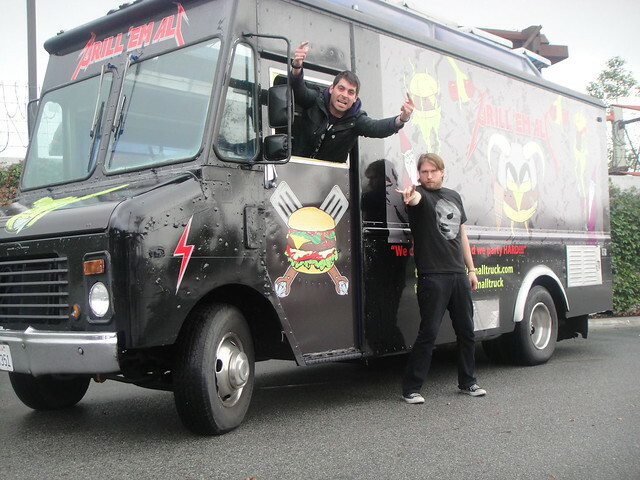 The brainchild of childhood friends Matt Chernus and Ryan Harkins have brought their love of heavy metal and backgrounds in culinary cuisine to create a food truck that's rockin' the LA mobile cuisine scene. Names: Matt Chernus (33) Ryan Harkins (32). What inspired you to start the Grill ‘Em All Truck? We were both toiling away in the industry working for other people and we were growing tired of it. We had been talking about opening our own place but did not have the capital. At that time gourmet food trucks were just starting and it was an easy way to get things started with a limited budget. What was it like being on The Great Food Truck Race? In retrospect it was a lot of fun. I mean we traveled across country on some one else's dime. But it was tough. The truck was over 20 years old. What they did not show you were the 12 hour drives and countless breakdowns. The Dee Snider: Burger topped with Peanut Butter, Jelly, Sriracha and Bacon. It’s a well-known fact that your burgers are out of this world and definitely out of the box flavor wise. Who comes up with those crazy delicious burger combinations? Ryan created the menu and our head chef, Ken Smith, comes up with specials and other stuff. Together we have a pretty demonic culinary team. Did you have originally have a restaurant in mind when you started the truck or did the trucks success inspire you establish Grill ‘Em All in brick and mortar form? We always wanted a real restaurant. Nothing against the truck culture but we have never been shy about using the truck as a stepping stone. Will you have an expanded menu in the new restaurant? Yes, lots of new burgers along with some of our favorite specials of the past 3 years and truck favorites like the Behemoth and Dee Snider! 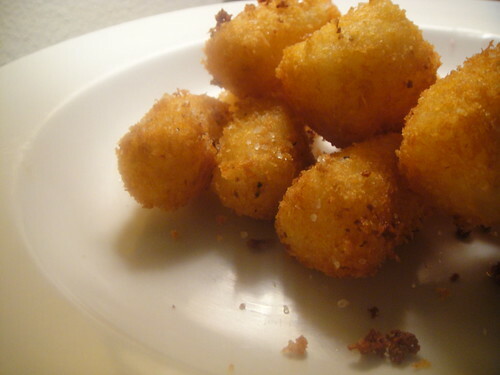 H-100's: Hand made cheddar and jack filled, panko crusted tots. We’re definitely excited for the restaurant! We’re hoping h-100’s (tater tots stuffed with cheese) will be on the menu since they always seem to be sold out on the truck! Right now we plan to have H-100s once a week. Tater Tot Tuesdays! Since you guys are constantly surrounded by other food trucks do you have any favorites that you grub at? I love the Flat Iron Grill and Mandoline Grill. Assuming it’s not on the menu already, what’s in your absolute dream burger? Are you jonesing to crush some burgs? 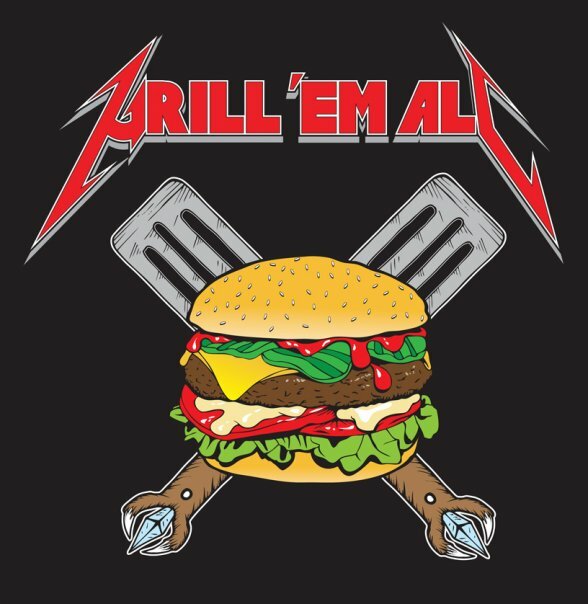 You can find out where Grill 'Em All will be next by following them on twitter or facebook! They also have their first restaurant opening in Alhambra, CA very soon! For the latest updates on the new restaurant follow @GrillEmAllBurgs on twitter! What brought them to CA from OH? Those people who are interested about reading of his life experiences can read this interview that keeps them. Students of all classes like to hire writers of uk dissertation services for writing of their mistake free works. The article you have shared here very good. Tally kya hai This is really interesting information for me. Thanks for sharing!